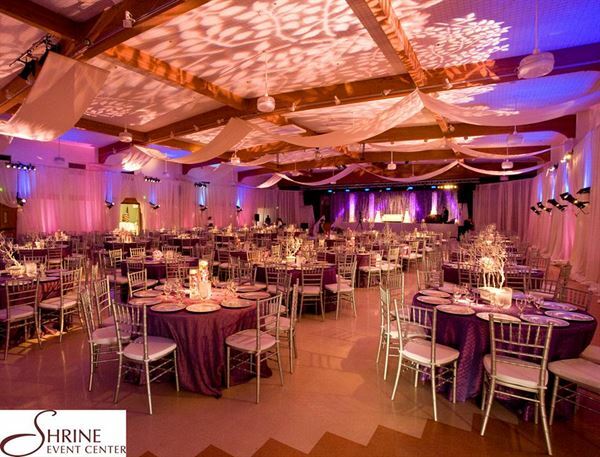 Conveniently located in the beautiful Livermore Wine Country with easy freeway access, the Shrine Event Center offers a beautiful ballroom perfect for an elegant reception for up to 450 guests or for meetings up to 800 guests. Towering palms and lithe willow trees flank the Shrine Event Center, whose spacious interior has hosted many wonderful celebrations. The grand ballroom is larger than most event facilities in the area, and it can take on any theme you have in mind. Included in the rental fee is hardwood floor stage, tables, chairs and their set up/take down and parking is free. The rental rate includes: - 5 hour event time - 2 hour set up time - 1 hour clean up time - Main hall, kitchen, lounge and stage event space Audio/Visual event equipment available for rent for additional fees. Cost of Shrine Security Coordinator, Security Guards, Event Insurance and Overtime not included in rental rate. All events must end by midnight. Overtime charge is $150 per hour until midnight. 50% of the rental fee is due with the rental contract to confirm the event date. The remaining balance is due 90 days prior to the event date. If the event is canceled for any reason, all monies will be forfeit, excluding the refundable security deposit. A $2,000 refundable security deposit, is paid back after the event if there is no damage or any extra charges incurred. Security guards may be required at the rate of $30 per hour, are based on guest count and will be included in the rental contract. We are available to show the facility Monday through Friday from 8:00 am to 3:00 pm. You may make an appointment for weekend site tours. If you are planning a meal or refreshments you may use a licensed caterer of your choice, or bring your own food. Caterers must be pre-approved by us, so please do not sign a contract until the approval process is complete. The rental rate includes: - 5 hour event time - 2 hour set up time - 1 hour clean up time - Main hall, kitchen, lounge and stage event space Audio/Visual event equipment available for rent for additional fees. For over 450 guests, add $300 to rental rate. I held my wedding at this venue in August 2011. I have to say I am nothing but pleased with this place and its staff. The venue has awesome draping in the ceiling which with some uplighting creates the perfect colorful atmosphere. Its very spacious and has a few rooms which you can rent. I only rented the main ballroom and its bar/lounge area for drinks. I had a live band which was on the stage. I have to say when I first came to this place I was amazed and knew it would be perfect for my wedding. The rental manager Lisa was more than helpful making sure all the things I needed were taken care of and making sure my wedding was perfect. The parking lot is very spacious and has private security. If your looking for a great venue, i will definitely recommend putting this on your list of must-sees!